532' by 46'6" by 16'9"
1943-11: Tama and Kiso landed two single 5" guns in return for a 1x2 5" mount, 4x3, 6x1 25mm guns, and 2 13mm/76 machine guns. Tama adds Type 21 radar. 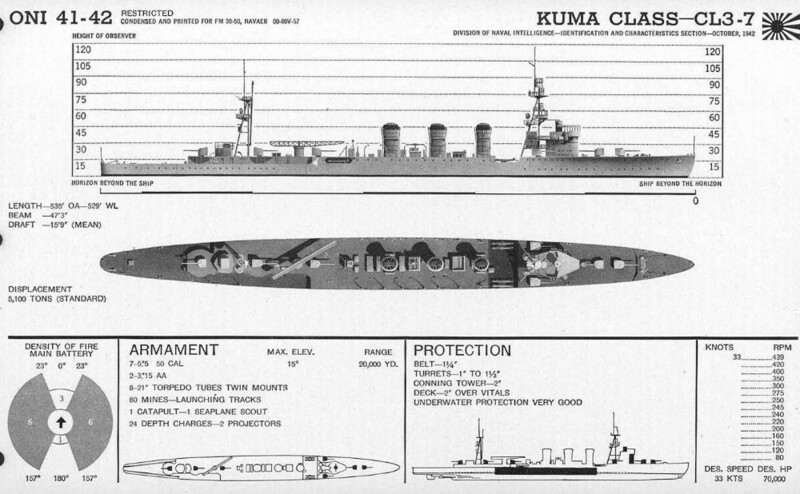 The Kumas were completed in 1920-21 as general-purpose light cruisers, capable of acting as destroyer squadron leaders, as escorts or scouts for the battle fleet, or for commerce protection. 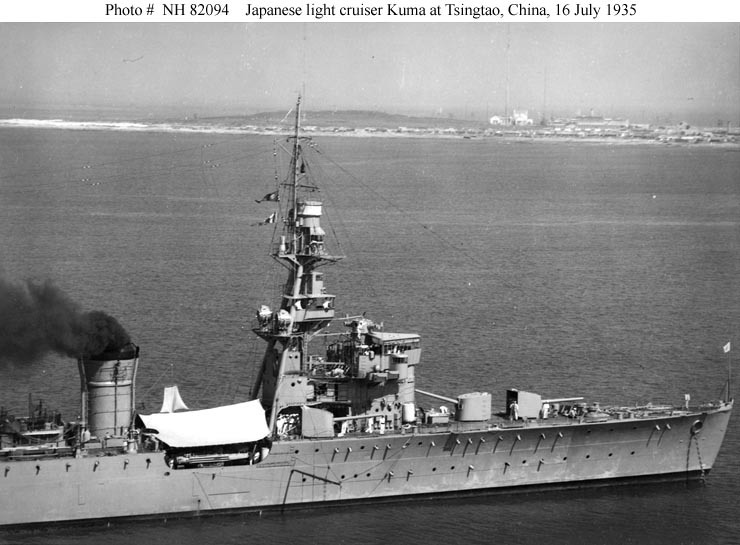 They were essentially enlarged Tenryus, and subsequent classes of Japanese light cruisers were very similar in specifications. The Kumas were strongly built and had excellent seakeeping, but their crew accomodations were cramped, hot, and noisy. 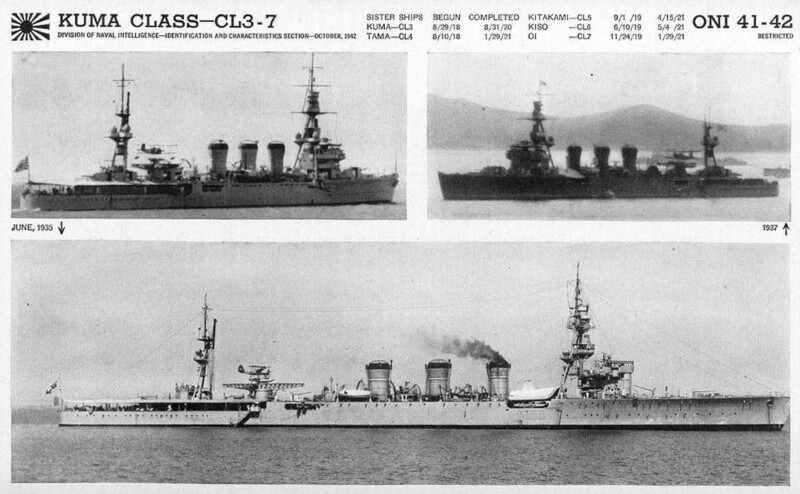 The class was extremely maneuverable, one commander boasting that his ship “could maneuver on the crest of a wave.” They were powered by then-new Mitsubishi-Parsons-Gihon turbines, which had high-pressure and low-pressure halves that were fed steam in series for economical cruising and in parallel at maximum power. Two of the boilers were originally mixed-fired boilers that could handle either fuel oil or coal, but these had been removed long before war broke out. Protection was very light at 3.7% of displacement, being designed against the 4" guns typical of U.S. destroyers of the time. The main armament was arranged as five single mounts on the centerline and two single wing mounts. This meant that only six of the seven guns contributed to the broadside,but it allowed four guns to fire straight ahead. The Kumas were badly outdated by the start of the Pacific War. Several redesigns were considered, including conversion to minelayers or training vessels. Two of the class (Oi and Kitakami) were converted to torpedo cruisers before the start of the war and are treated as a separate class. Torpedoed 1944-1-11 off Penang by Tally Ho!